President Serzh Sargsyan and his Azerbaijani counterpart President Ilham Aliyev reportedly agreed to respect ceasefire and continue to work on finding a peaceful solution to the conflict when they had their first contact after the April war. Political analyst Alexander Iskandaryan, the director of the Yerevan-based Caucasus Institute, said that by meeting in the Austrian capital through international mediation, the two South Caucasus countries’ leaders just tried to move the conversation from the battlefield to the negotiating table. “It is an attempt to resume the negotiation process, which is not bad, and in terms of future prospects there have been promises that negotiations at the level of presidents will continue. The main purpose of all this is to return from hostilities to the track of political settlement. I am far from thinking that mechanisms of trust will give some results now, after so many years and this war. In fact, more time is required to restore such confidence. Let’s wait and see,” said Iskandaryan. According to Iskandaryan, it is hardly possible that they stop shooting at the line of contact between Karabakh and Azerbaijan, as well as at the border between Azerbaijan and Armenia, but the fact that there is a political process is not bad. The political analyst also said that if there are not shootings from the Azerbaijani side, peace will be established at the line of contact. “Armenia does not need to shoot. During the 1992-94 war, the Armenian side achieved the goals it had set itself to achieve. Now shooting is aimless for Armenia and Karabakh. Azerbaijan has the opposite situation: they have a rational need to keep the situation tense at the line of contact. There are many examples when a conflict was resolved by military means, but the April events showed that in this case it will not be the case. They should sit at the negotiating table. It is what the OSCE Minsk Group co-chair countries are striving for,” said Iskandaryan. Nijat Melikov, the press secretary of the Azerbaijan National Committee of Helsinki Citizens Assembly, presenting the public and political mood in Azerbaijan, said that although there is a segment of Azerbaijani society that supports a peaceful solution to the problem, however, the main part is for the settlement of the conflict by military means. 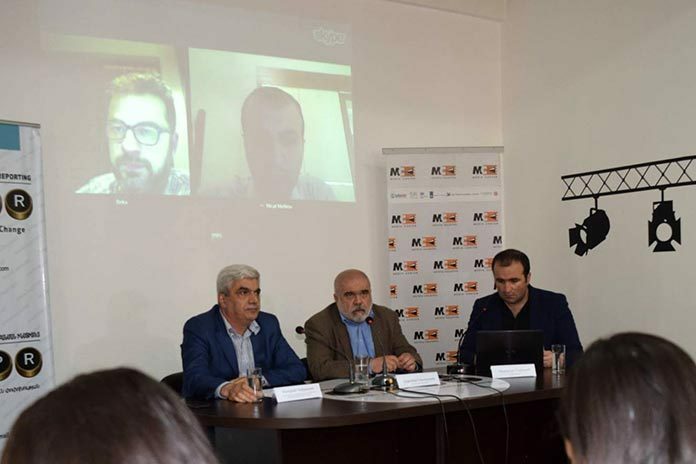 Stepan Grigoryan, the head of the Analytical Centre on Globalization and Regional Cooperation in Yerevan, said that in order to achieve any progress in the negotiation process, first and foremost, snipers should be withdrawn from the line of contact. According to him, if people are killed while the sides are talking over issues, then what are the results of those negotiations? “Well, we say, the talks were held at night. It’s very good that they negotiated, but our soldier was killed at night,” said Grigoryan. In the small hours of Tuesday when the meeting between Sargsyan and Aliyev in Vienna was still in process, 20-year-old conscript Khachatur Harutyunyan was fatally wounded at the line of contact between Karabakh and Azerbaijan. That day Baku also said one of its soldiers was killed by Armenian forces in the conflict zone.